on the 20th - we went to pick up teresa n joyce n head to 1u as planned n we easily found our way thr.we reached thr about 3.30pm..and of course shopping again..haha..but we are so excited bout the sushi buffet coz actually we are hungry. we only took light breakfast..estee n teresa din join us for shopping coz they wan to find a place to sit down n start their "work".so oni me n j0yce...saw something very nice at la senze but too bad no more size..
den sharp at 6.30pm we are in the restaurant already...haha..the salmon sushi was great..only one word to describe our dinner - fantabulous !!! companion was great and food was great n we laugh a lot...here are some pics to share n last but not least hapy burfday estee darling!!! i hope u had a great day on ur burfday !! life is alwiz not as smooth sailing as we alwiz wanted to be is it? it is alwiz testing our patience and skill in makin decisions..
this is my last chance so tat i can start studying again in june but if i do not make it again i will hav to wait for another yr...but if another yr pass wil i be able to find the courage n strength to study again..i felt bad terribly for lettin mom down..i went bac last week n bonded wif her greatly,slept together wif her n she "belai" me like a little kid who did not grow up...this is my greatest resolution this yr..to pass my this exam n continue my advance for another 2 yrs.den mom can be proud of me...i know i m left wif not much time and i will make full use of it now...i wan mom to see me in the convo..n make her feel proud..mom..i will make ur this yr burfday a memorable one..tat is to see me graduate !!! yien,thank u to u so much too for tolerating my nonsense avday after i m bac from work..thanx for being such a great r.mate n fren..wen are u coming bac to kl..fast fast lo..and thank u for alwiz supportin me in everything i do..i appreciate it a lot gal..hope to see u soon in sabah..takecare n putmore sun block oh..
applesiew...its time to show some results..n i know u can make it!!!!! kanbateh !!!!!!! 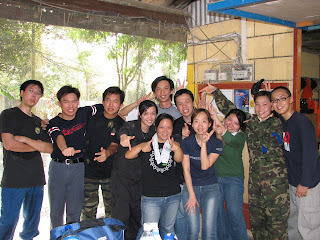 was pretty excited..have been wanted to try this game for so long..the place was pretty far and isolated but luckily wilson manage to find tat place..
we started at bout 11 somethin.was given short briefing by mr.razak on short history of paintballs and safety precautions.since they were 16 of us so we were divided into 2 groups of 8ppl..we had a few rounds of game and we were joined by a few professional players...game was exciting but if u get shot..my goodness,it so damn damn pain..but the pain was worth it..